A pyranometer is used to measure the energy from the sun. When leveled in the horizontal plane, this measurement is called the Global Shortwave Irradiance (GLOBAL) and when positioned in a plane of a PV Array, it is called the Total Irradiance in the plane of array (TPA). 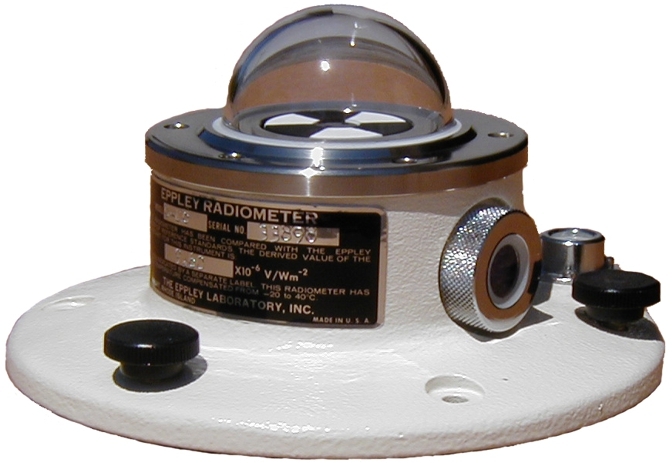 Inverted, a pyranometer is used to measure the Reflected or Albedo Irradiance (ALBEDO). A pyranometer can also be shaded from the direct beam of the sun to measure the Diffuse Shortwave Irradiance (DIFFUSE). The Black & White Pyranometer, Model 8-48 is most often used in the highest quality networks as a Diffuse (shaded) instrument. While “all black” pyranometers such as the SPP, GPP (and PSP) are preferred for Global, Reflected or TPA measurements due to their better cosine response and time response, these do not significantly matter to a shaded pyranometer and the as Black & White has no offset that naturally occur in the all-black pyranometers, it makes it more suitable for Diffuse measurements. Recently, there has been much discussion on “uncertainty” and how it pertains to solar measurements. The RSS of the 9060 Secondary Standard specifications results in an uncertainty of approximately 3.5%. The typical uncertainty of Eppley’s 8-48 factory calibrations are less than 2%. The stated uncertainty of the WRR is 0.4%. Evidence from comparisons of 8-48 measurements to component sum derived values (using an AHF and 8-48) show the 8-48 is capable of hourly averages better than 5% and daily averages better than 3%. In terms of typical diffuse value, this would equate to less than 5 Wm-2.